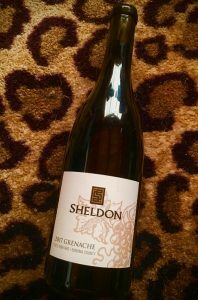 2017 Sheldon Wines, Grenache, Luc’s Vineyard, Sonoma County. It’s tradition for me to dig out a bottle of Sheldon Grenache to celebrate #grenacheday, and today, well September 21st, 2018, I had to change it up as I have drunk all of my old vintages of it, can you hear the tears? So, I opened a new release sample from Dylan and Tobe Sheldon, owners of this small “micro” winery based in Santa Rosa, it being the upcoming 2017 Luc’s Vineyard Grenache from a tiny hillside vineyard in the new Fountaingrove AVA, just south of the Russian River Valley region, with cool Pacific influences and a interesting mix of soils and exposures. Dylan is an evangelist for Grenache and has been since the late nineties and has crafted small versions of his own since about 2003, in fact he made wine at Chateau de Saint-Cosme in Gigondas on his honeymoon, with his wife Tobe, under the famed Louis Barruol! This 2017 was whole cluster, that was very gently bladder pressed on a part Champagne style cycle, a fraction schedule with only two barrels made. The maceration was classic with a lots of hand working and there is some youthful gripping extract, while the texture is round and medium bodied with fine acidity and remarkably delicate in detail and flavor. The aromatics are incredible and you can whiff this stuff from miles away, with a heady mix of deep floral tones, spice and anise coming from the glass before leading to a vivid and vibrant palate of mouth watering layers of tangy red currant, garden strawberry, plum and peppered raspberry that is much more subtle than you expected from the nose in this glimmering garnet/ruby colored 100% Grenache. Crushed lilacs, dried lavender, minty herb and melted black licorice all make fleeting appearances in the back ground along with a touch of iron, dusty pomegranate and briar/savory elements that make this a racy wine, it’s not a wine that isn’t overtly ripe or fruity, but one that should gain from another few years in bottle, it will add a more generous nature over time. Grenache in California tends to be it’s best with either longer elevage and or extra time in the cellar, and this one clearly only hints at it’s potential, as nice as it is now, there’s much more to come.